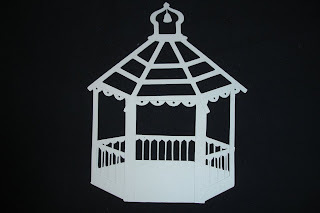 Karen, a blogless Cricut message board member, designed this gazebo and wanted to share the file so she asked me to post it on my blog. I think she did a terrific job on this - she said it made her feel like a builder! The cartridges she used are George, Plantin Schoolbook, Accent Essentials, Speaking of School and Dreams Come True (I think that is a complete list). I have not test cut this file but you can see her result above - very cute! Here is her file - please remember to give credit where it is due - to Karen, not me! I think I may use it on a wedding card. Blog Celebration & Challenge - with Gifts!